"Sgt. Pepper's Lonely Hearts Club Band" begins its 27-week run at #1 on the UK Album Chart. (It would hold the #1 spot for 15 weeks here in America.) It would also go on to win The Grammy for Album Of The Year and eventually sell upwards of 30 million copies worldwide. 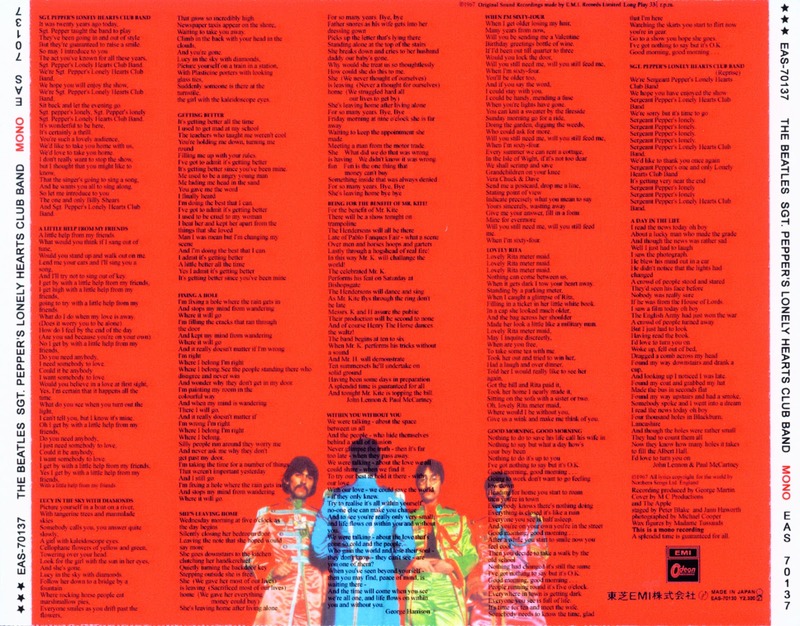 Ringo Starr (who was bored during most of the lengthy recording sessions … and later said he learned to play chess during the making of "Pepper") would later boldly refer to this landmark album as "a bunch of songs … and you stick two bits of 'Pepper' on it and it's a concept album. It worked because WE said it worked." 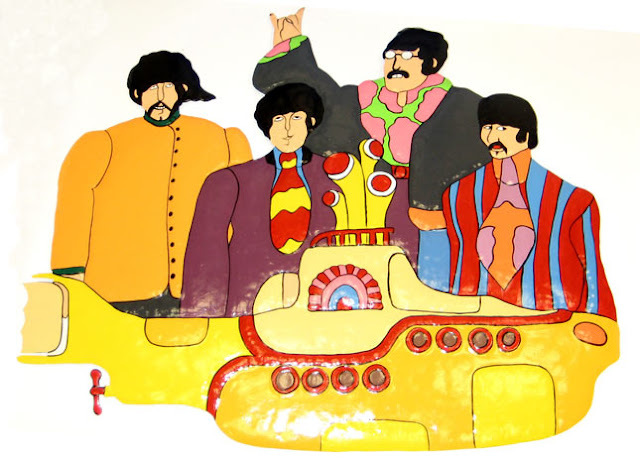 The Beatles were used to setting trends in the recording industry. A year later, they were advised by everybody in their record company and production staff that "Hey Jude" needed to be trimmed to under four minutes because "NOBODY will play a seven minute single on the radio." John Lennon's response to that? "They will if it's us." And play it they did … "Hey Jude" topped The Billboard Hot 100 Pop Singles Chart for nine straight weeks! The Monkees begin recording the Carole King song "Pleasant Valley Sunday". (It will be completed a few days later.) The track will be released as a single in a few weeks and later appear (in a remixed form) on their "Pisces, Aquarius, Capricorn and Jones, Ltd." LP. Jimi Hendrix (soon to be touring as an opening act for The Monkees) was denied entry into London's Botanical Gardens today because "people in fancy dress aren't allowed." The song takes its classical feel from Johann Sebastian Bach's "Orchestra Suite in D" … and the matter regarding just who helped contribute to the writing of the Procol Harum hit has come under much debate the past several years. Gary Brooker (who also sang the tune) and Keith Reid were listed as the original song writers when the record was first released in 1967. However Matthew Fisher has also since laid claim to having a hand in the writing of this brilliant piece … he played organ on the tune, around which the song's unique sound is based. (If this is true, shouldn't Johann Sebastian Bach ALSO be credited???) When Fisher's case was first thrown out of court (making a claim like this some 40 years AFTER the song has become one of the most recognized compositions in pop history), he figured all was lost … but in 2009 The House of Lords overturned that decision … and granted him a share of all future royalties. Brooker therefore claims credit for the rest of the tune built AROUND the organ part (one cannot help but wonder exactly what part THAT is!!!) and Reid continues to receive credit for the inspired lyrics. Fisher claims he only wanted credit for what he had done and wasn't seeking anything in the way of back royalties. He seems content to make whatever he makes moving forward from the ruling. He says he first received a call from the band when they responded to an ad he ran in Melody Maker, stating that he had access to a rare Hammond Organ. He was immediately brought on board as a member of the band. 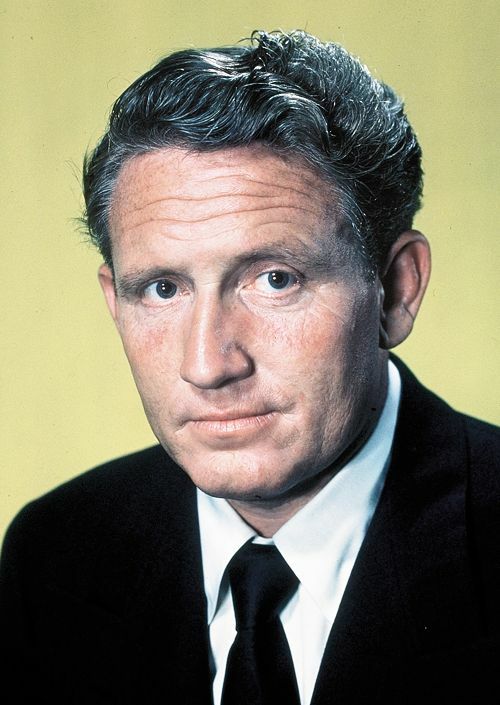 Actor Spencer Tracy died today. He was 67. His last film, "Guess Who's Coming To Dinner", was completed just prior to his death. Tracy would go on to be nominated for an Academy Award for Best Actor for his role as Matt Drayton. 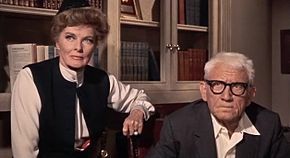 Costar Katharine Hepburn won the honor for Best Actress for her role as his wife Christina in this classic film … she claimed she never watched the completed film as it was just too painful to see Spencer Tracy in his final role. 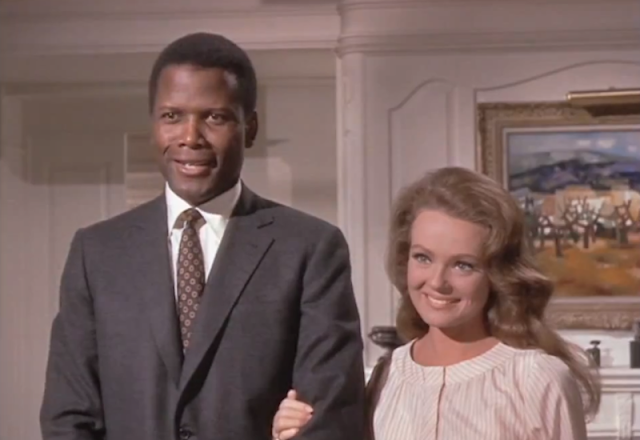 Although he wasn't nominated, Sidney Poitier was just OUTSTANDING in his role of Dr. John Wayde Prentice, Jr. It remains one of my favorite films of this or any other era. Big movers outside The Top 40 include "Up Up And Away" by The Fifth Dimension (up from #72 to #44), "Don't Sleep In The Subway", which looks like another hit for Petula Clark, as it climbs from #67 to #45, "Here We Go Again" is up another ten places, moving from #59 to #49 for Ray Charles, the Janis Ian hit "Society's Child" climbs from #75 to #56, "Pay You Back With Interest" is up 18 spots for The Hollies, climbing from #79 to #61, "Soul Finger" by The Bar-Kays jumps 15 spots from #78 to #63 and The Doors climb from #90 to #73 with their first big hit, "Light My Fire". 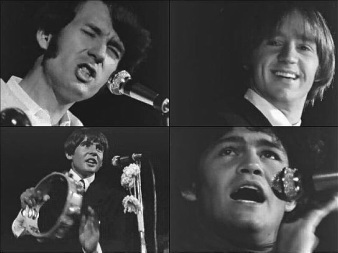 The Monkees perform live in concert at The Hollywood Bowl with Ike and Tina Turner as their opening act. Over 17,000 fans attend and witness an expanded set that now runs 65 minutes and includes many more of their recent recordings. This is also the night that Micky Dolenz famously jumped into the three-feet-deep fountain pool at the front of the stage. At a show broadcast from London, The Hollywood Palace boasts guests Bobby Rydell and The Small Faces. 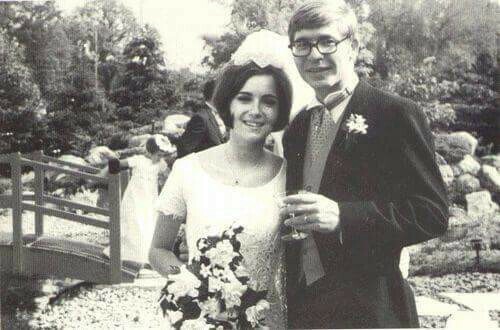 23 year old John Denver marries his first wife, Annie Martell, for whom he would later write the #1 Hit "Annie's Song". They divorced in 1983. Denver died thirty years later when the plane he was flying crashed. 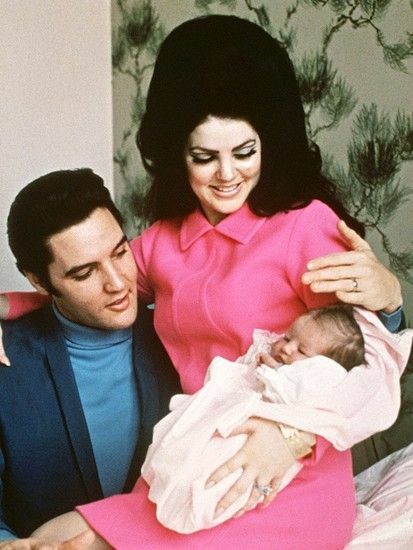 Priscilla Presley learns that she is pregnant, less than six weeks after her marriage to The King. Exactly one week after its release in Great Britain, "Sgt. Pepper's Lonely Hearts Club Band" moves into the #1 spot on the UK Album Charts, where it will remain for the next 27 weeks. (It will begin its run at the top of the US Chart for 15 weeks in the days to come) A landmark recording in so many ways, it took over 700 hours of studio time to produce, at a cost of about $45,000 (about $325,000 in today's money), then unheard of sums in the music industry. It was a legendary release in every aspect. Besides the incredible music contained within the sleeve, the album cover was also considered quite revolutionary. 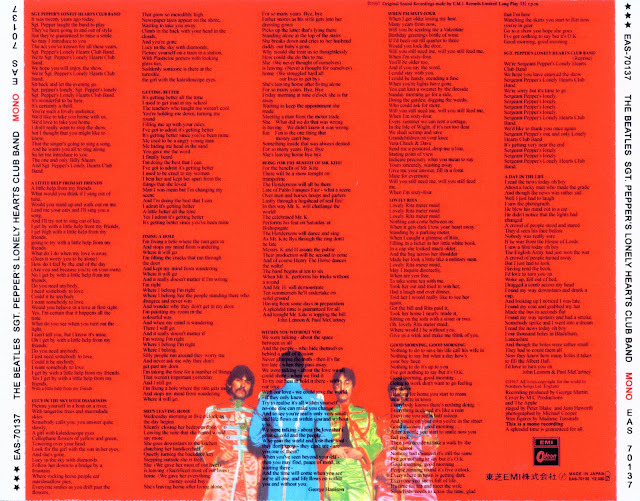 Perhaps best known for its unusual montage of photos on the front cover, it was also the first album in history to print the lyrics on the back album cover. The United States was indirectly involved with the six day war currently raging between Israel and its Arab neighbors when Israeli airplanes attacked the USS Liberty in the Mediterranean Sea, killing 34 US Navy crewmen. Israel later apologized, calling the incident "a tragic mistake" due to their misidentification of the ship. Top debuts on the chart this week include a couple of my personal favorites from 1967 … "C'mon Marianne" by The Four Seasons debuts at #65, meaning that it'll soon be in competition with Frankie Valli's solo hit, "Can't Take My Eyes Off You", which is currently the #20 song in America. 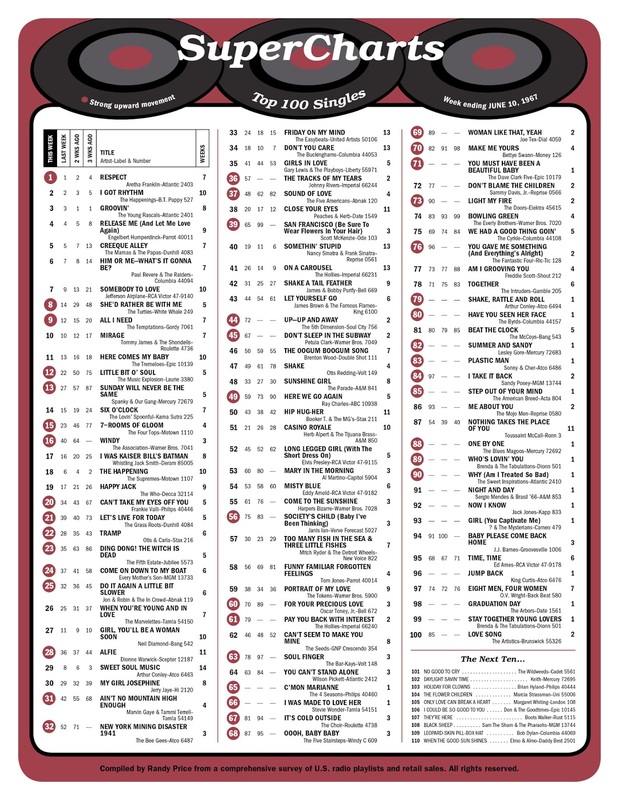 Stevie Wonder premiers right behind it at #66 with "I Was Made To Love Her", The Dave Clark Five are back on the charts with their remake of "You Must Have Been A Beautiful Baby", new at #71, and Chicago's American Breed make their national chart debut at #85 with "Step Out Of Your Mind". The Beatles announce their brand new animated film, "Yellow Submarine", now in development. 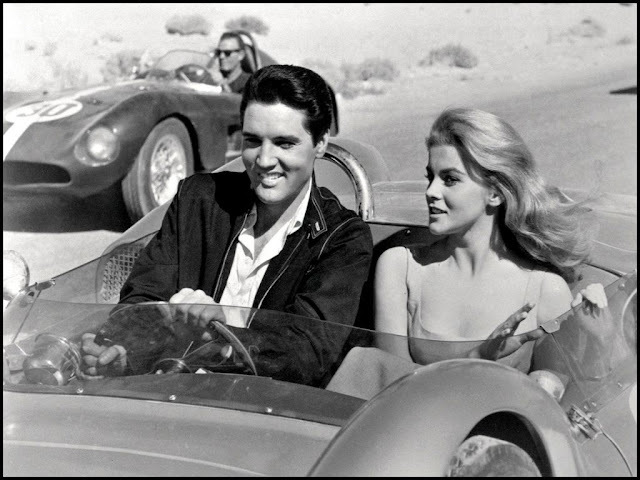 Elvis sends a guitar-shaped flower arrangement to Ann-Margret for her opening in Las Vegas. He will continue to do so for every one of her Las Vegas openings until the time of his death. Three members of Moby Grape were arrested for allegedly "consorting" with under-age school girls. They were caught in a parked car, each with a 17 year old girl. The trio paid their bail and then flew off to New York for a TV date. Eventually all of the charges were dropped. 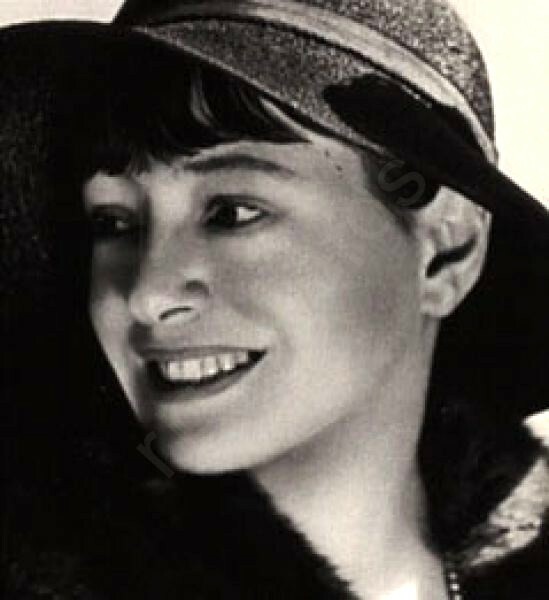 Writer Dorothy Parker ("A Star Is Born", "Big Blonde") died after a heart attack at the age of 73. Simon and Garfunkel record "Fakin' It". The NHL underwent major expansion today by holding a draft to fill the rosters of six new teams, thus doubling the size of The National Hockey League. (Expansion discussions began back in February and March of this year but the official draft to staff these teams was held today.) New franchises had been awarded to Minnesota (The North Stars), San Francisco / Oakland (The California Seals), Los Angeles (The Kings), Philadelphia (The Flyers), Pittsburgh (The Penguins) and St. Louis (The Blues). 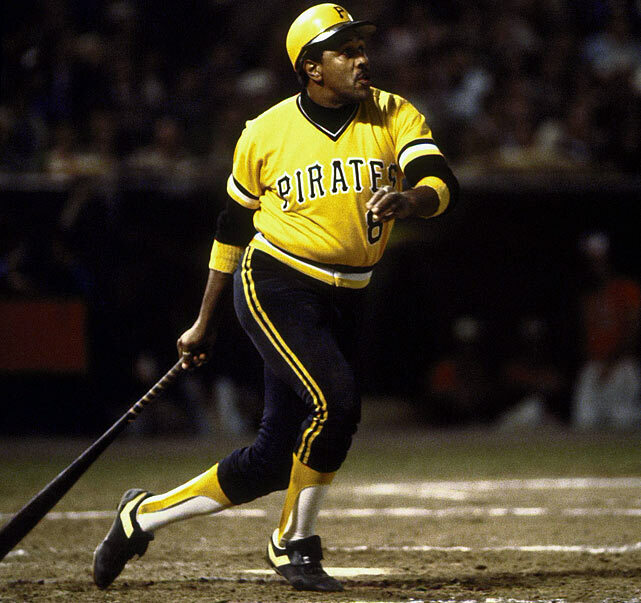 (Had any one of these cities not been able to pull a team together in time for the 1967-68 season, Baltimore was selected as their back-up plan.) Each team was allowed to pick 20 players from the existing NHL rosters. All six expansion teams were initially placed into their own division, thus insuring that one of the new teams would earn a post-season playoff position. Four of these teams still exist today in their original form. In between there is little movement in The Top Ten .. "Him Or Me - What's It Gonna Be" by Paul Revere and the Raiders is up a notch from #7 to #6, "Somebody To Love" by Jefferson Airplane climbs two places from #9 to #7, "She'd Rather Be With Me" by The Turtles breaks into The Top Ten for the first time, moving from #14 to #8 and "All I Need" by The Temptations moves up three places from #12 to #9. "Can't Take My Eyes Off You" by Frankie Valli continues to climb, this week from #34 to #20, "Let's Live For Today" by The Grass Roots is up 18 spots from #39 to #21, "Ding Dong, The Witch Is Dead" by The Fifth Estate moves up 12 places from #35 to #23,"Come On Down To My Boat" by Every Mother's Son, jumps 13 spots to #24 (from #37), "Ain't No Mountain High Enough" by Marvin Gaye and Tammi Terrell move ups 11 places from #42 to #31, "New York Mining Disaster, 1941" by The Bee Gees climbs 20 spots from #52 to #32, Johnny Rivers' latest hit, a remake of Smokey Robinson and the Miracles' hit "The Tracks Of My Tears", is up 21 places from #57 to #36 (it'll be a hit again for Linda Ronstadt in another decade … a good song is a good song is a good song! ), while "Sound Of Love" by The Five Americans moves up 11 places (from #48 to #37) and "San Francisco" by Scott McKenzie is beginning to look like the hit The Mamas and the Papas gave away as it climbs from #65 to #39, a jump of 26 spots. The Monkees complete their run in the #1 spot on the album chart as "More Of The Monkees" notches its 18th and final week at the top of the chart.